I have a fun new card up over on the Scrapbook Circle blog today! I LOVE playing with hexagons and woodgrain. Just say'n. I used the fun fa-la-la stamp from The Alley Way as a quick sentiment on this one, too! YAY! Head on over to the Scrapbook Circle blog to check out my card! Thanks! awesome hexagons...Have a great weekend.. So cute~I love hes, too!! Super cute card!!! Love hexagons too..heading over to take a look. Just poped over to see the complete card ....love it ...the hexegons are so much fun with the grained background. 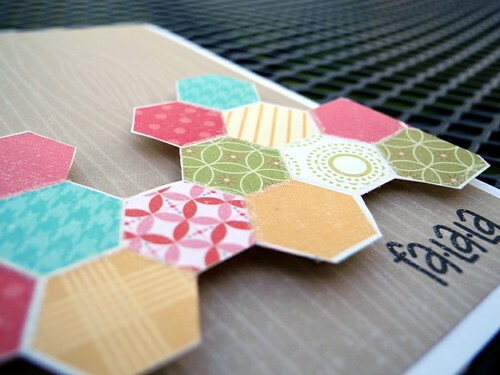 Very cool hexagon card! Love it. You're one talented chic! The woodgrain with the hexagons are a fantastic combo! The bright patterns look GREAT!!! I see that hexagons are real big this year.